Quite a few years ago I became aware of Bhutan and their use of “Gross National Happiness” as a measure of national status, almost in some sort of opposition to “Gross Domestic Product”. This isn’t a blog on economics and politics, but I’ve always been sceptical about the link between wealth and happiness, and these days I think it’s reasonably well accepted in mainstream economic theory that once you get past a certain basic level, wealth and happiness are not really all that directly linked. Various measures like the “Human Development Index” and “Happy Life Years” have been developed to try and quantify some of these sorts of things. Per capita GDP might have increased by 50% over the last X number of years, but people aren’t 50% happier, they are generally about as happy or unhappy as they have always been. Anyway, this isn’t the place for serious economic debate, but….. Living far far away in a corner of our round world, I often use that wonderful organisation, the postal service, and I recently noticed something interesting. Pencils and Bhutan do not mix! The International Post Guide (Oct 2004) notes that Bhutan has an import restriction on “Pencils, lead and propelling”. (Propelling pencil is the customs term for mechanical pencils). This would seem to imply that “pencils = unhappiness” in Bhutan, or at least “foreign pencils = unhappiness”. Maybe mechanical pencils are the root of all evil, or something like that? Maybe they are protecting some traditional domestic Bhutanese Himalayan pencil making industry. Who knows?!? A little more digging also revealed that their neighbour, India, has the same import restriction, whereas Afghanistan restricts “Pencils, propelling” but not ordinary lead pencils, and Romania has some restrictions on “Propelling pencils” unless they are gifts. The rest of the world does not seem to take such a dim view of mechanical pencils and allows them free passage to spread their good or bad words around the globe. Though most countries will probably whack you for sales tax, import tax, carbon tax, form-filling out tax, bio-security tax, tax-tax, and any other tax they can dream up! A reasonable number of people contact me trying to find out about the old mechanical pencil they used many moons ago back in school, etc. I'm afraid I'm generally not much help - so many zillions of pencils, so few of them ever made it my way, - particularly 10 to 20 years ago, i.e. pre-internet for me. Some folk email me direct and some leave their question in the guestbook - see the label on the sidebar. Anyway, as a typical example, heres part of the latest question on the Guestbook. I wonder if you can help me find a mechanical pencil I used about 10 years ago...It was called "Spike," but I don't recall the manufacturer. It used a 1.0mm lead, which was my singularly favorite feature. I seem to recall a twist-out eraser, like a Staedtler. It couldn't have been very expensive, either, and I must have bought it at a discount store like Wal-Mart. Does this ring any bells? So, maybe someone out there might know the answer and might want to help. And any of you who cruise by every now and then and are in a generous, helpful frame of mind, might like to keep an eye on the Guestbook questions and give us the benefit of your knowledge. Well here’s my first review of a pencil from Tombow. I must admit to being a little ignorant of Tombow these days. I get the impression they have basically withdrawn from the mechanical pencil market, at least outside of Japan. I had wanted an Oceanic for a long time, but never got around to buying one, and then it was discontinued a few years ago, so I had sort of given up on it. But last year I saw some new stock for sale on eBay…….. Certainly you would never accuse the Oceanic of being another “me too” generic design. 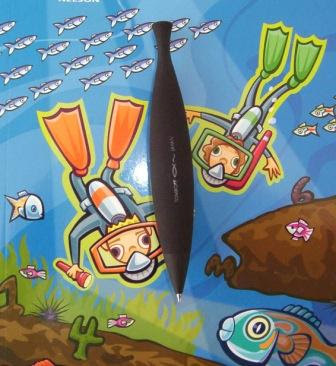 The rounded stylised fish shaped body is obviously very reminiscent of its name, and it is one of the fattest pencils in my collection. This is definitely a pencil for those who like a wide grip, as its about 12 to 15mm diameter where I usually hold it. It has a very unusual surface finish – not fish scales, but a rough surface, although a very fine one. I haven’t really seen anything much like it. It sort of feels like a flocked finish, but using something a bit tougher and rougher than ‘velvet’. The front tip section is matt black plastic, then it becomes the roughened main body, then the “tail” section is black rubber except for the very end which is again the roughened body material. The push top ratchet lead advance mechanism is operated by simply pushing down the top of the tail. The rubber tail section compresses allowing the mechanism to work. There is a small eraser under the top, or rather the tail. It looks like it is a rubber compound eraser. The lead chamber came loaded with 6 leads, so no cheap penny pinching there. The roughened surface finish really does give great grip, but the fat diameter may not be to everyone’s liking. I am not sure how well I would handle it for very extended periods of writing. The lead sleeve is short and shaped so this pencil is for writing only. No big surprise there. I would prefer that a longer length of lead was advanced with each activation of the mechanism. I had to keep clicking a lot more than normal. I think this is also a desk instrument only. The lead sleeve is not retractable and there is no pocket clip so its not really designed for carrying around. Since it’s big and round with no pocket clip it will roll around on your desktop. This pencil is designed to look good, at the expense of a little utility. The only markings on the pencil are “Tombow”, the Oceanic symbol, and “Japan” in light lettering on the centre of the body. 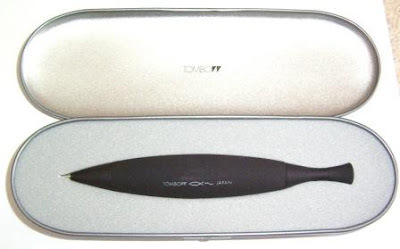 My Oceanic is a 0.5mm lead model (SH-ZLF11), and came in a nice but simple presentation tin, inside a lightweight black embossed cardboard package. Best Points – The roughened surface finish and the overall “Oceanic” look. Not So Good Points – The rolling around. Dimensions – Length 132mm, diameter 20mm at widest part. Balance point about 65mm up from the tip. 1565 is a big year for pencil people, for it was then that “De Rerum Fossilium Lapidum et Gemmarum Maxime, Figuris et Similitudinibus Liber” by Swiss naturalist Conrad Gessner was published. In this great tome on fossils he included a sketch and brief description of a very useful new piece of equipment he had acquired, namely his pencil, and this is the very first record of a “modern pencil”, one that used graphite. Conrad Gessner’s sketch and description of his pencil are reasonably brief and vague, leaving some room for conjecture over the exact details. 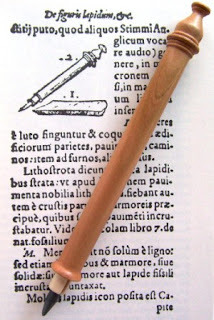 He describes the pencil thus “The stylus shown below is made for writing, from a sort of lead, which I have heard some call English antimony, shaved to a point and inserted in a wooden handle.” So, some four and half centuries later, Cleo Skribent have taken this, and used it to produce “Der Gessner”, their version of Conrad’s pencil. So what exactly is Der Gessner? 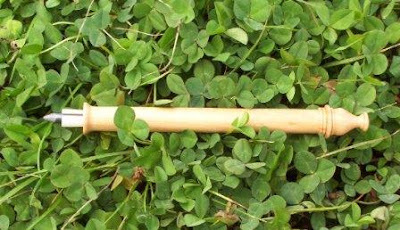 Well it’s quite simple really – it’s a turned, round wooden body (or holder) with a hole drilled up its length, but not so far as to come out the top. A standard 5.6mm lead fits up inside the body and is secured in place by a tapering wooden split sleeve at the mouth of the body. That’s it. So really, to my way of thinking, it’s actually a leadholder, a sketch pencil in my personal terminology, an ancestor of todays leadholders or clutch pencils. Personally I don’t think Cleo Skribent are particularly well known as a pencil manufacturer, so by way of brief introduction, they are a German writing instrument manufacturer and for Der Gessner they emphasise their efforts to ensure the pencil is handmade to the highest standards in the tradition of the master artisan, and the German tradition of quality manufacture. 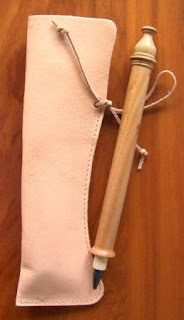 They offer several different options for Der Gessner – for example in a hessian pouch, in a leather pouch, or a complete pencil set including knife, leads, etc all in a very interesting looking wooden box. I’m pleased to say that I think Cleo Skribent have lived up to their own hype regarding quality of manufacture. The leather pouch is very fine leather, double faced where visible and well stitched. A plain simple piece of good quality work. My only quibble about the pouch is that it is a very light coloured leather and so can show graphite marks from when you take the pencil in and out of the pouch. These graphite marks are not that easy to remove. The pencil itself is equally good quality woodwork. Regular readers of this blog will know of my family connection to the “wood trades”, and my disappointment with a previous piece of wood I purchased. 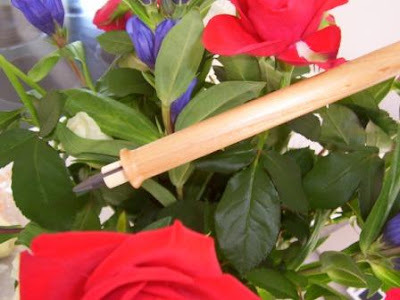 This time round, I am happy to say that I think the Der Gessner pencil is an excellent example of the woodturners art. Very smoothly finished and polished. Personally I prefer a slightly heavier grained wood, but that’s just a personal thing. I am glad they decided to stay with the natural finish and feel of the wood and didn’t apply a heavy clear lacquer or varnish finish to the pencil. How does Der Gessner feel in the hand? For a such a large pencil its surprisingly lightweight. It’s quite a thick bodied pencil, actually a little too thick for me personally. To be honest, I have a touch of OOS/RSI/Carpal Tunnel and it was playing up, so that could be clouding my judgement. Anyway, like I say, I think I would have preferred a slightly thinner body. There is no special grip section or enhancements, but you don’t really need any with this pencil. It’s interesting to have the feel of wood beneath your fingers. I did find the flared lip at the base quite useful for positioning my fingers. The body is perfectly round and there is no pocket clip so it will roll around on your desk when you put it down, which can get a bit annoying. Now I’m normally not that impressed with the erasers on most mechanical pencils, and Der Gessner has no eraser at all. I did wonder though if they hadn’t missed an opportunity to put one somewhere. Perhaps make the top knob a pull off one with an eraser underneath. But then I suppose that would be not be staying true to the original design. As mentioned earlier, the lead is held in place by a split sleeve which itself push fits into the body. The sleeve can come loose during transport or if you drop the pencil, etc thus allowing the lead to fall out. Obviously the harder you jam the sleeve into the body the less likely this is to happen, but I worry about starting to deform the sleeve by pushing it in too hard. Good and tight in the short term, but in the long term it might affect the performance. I wonder if you can buy replacement sleeves? It appears the wood of the sleeve is a different species to the body, so presumably its been selected for its mechanical properties, and my fears are probably overstated. Sometimes you get a little creaking sound from the sleeve/body joint when you are writing, particularly as you rotate the pencil in your hand. This can also make the lead wobble just a fraction when you start writing again. Very occasionally the sleeve can be pushed in too lightly and the lead slides through the sleeve when you start to write, but this isn’t common and more a matter of getting used to how to use the pencil. But overall this sleeve system works quite well. Photo - Der Gessner 5.6mm lead + sleeve, and 0.5mm lead for comparison. Whoa! 5.6mm lead! Remember, way down deep, I’m a guy who still sort of thinks of 0.7mm as thick lead. So 5.6mm?!? Well, I didn’t bother trying to do any really fine writing on small font computer print outs, etc. I confined myself to more general writing. If you keep rotating the pencil then you can keep a reasonably sharp point on the lead for a period of time. The plain round body of Der Gessner assists with this. I tried sharpening the lead with a knife, but then thought I’d try an ordinary pencil sharpener. This initially took a little bit of effort, but once you’ve got the hang of it, it’s quite successful. It also puts a reasonably long tapering point on the lead. The leads supplied by Cleo Skribent are actually repackaged Koh-I-Noor leads. The 2B leads that came with my pencil are inscribed “KOH-I-NOOR HARDTMUTH 4865/2B”. Cleo Skribent appear to offer grades 2B, 4B and 6B, in plastic cases or glass tubes. The glass tube is basically just an ordinary test tube with a cork stopper, but I like the idea. It seems the sort of thing Conrad Gessner himself might have used. There are no markings of any kind whatsoever on the pencil or leather pouch. I generally prefer to have at least some indication of the manufacturer and model so you know what’s what in the future. I guess somehow they could impress a Cleo Skribent / Gessner logo somewhere. Well, that’s about it from me. I salute Cleo Skribent for creating this pencil. I’m glad to own it, and I think that if you are a pencil collector then you have to consider getting a Der Gessner, because basically this is where it all started. Price Range – Mid to High depending on the option you choose. Dimensions – Length 154mm, diameter 12mm at main body. Balance point about 75mm up from the tip. Photo - Der Gessner and one of my uncles creations from an NZ native timber. Conrad Gessner (1516-1565) is an important figure in scientific history, particularly the natural sciences, and is sometimes referred to as “the founder” or “the father” of modern zoology. He was a great field naturalist and loved hiking in the mountains, both for study and for enjoyment. Now, I don’t want you to think that I’m trying to compare myself to Conrad Gessner, but if you have read this blog for a while you will probably be aware that I am a little bit of a part time-time field naturalist myself, and so as part of the review of this pencil I thought I should take “Der Gessner” out into the field, just as the great man himself would have done all those centuries ago. So, how does Der Gessner stack up against a modern pencil like the Lamy Scribble that I usually carry out in the field? Well, I guess we shouldn’t be surprised; time and technology has marched on since Conrad Gessner’s day, and there’s no real contest between Scribble and Der Gessner. To me, Scribble wins hands down. Der Gessner has no pocket clip although you could tie a string to the knob on top and attach it to a notebook. There is no eraser, it’s quite a large pencil so not really pocket-sized, its perfectly round and so rolls on a flat surface (the wind nearly rolled it off a bridge when I put it down for a second), the lead is not easily retractable, the lead can slip out of the pencil body during transport and so on. 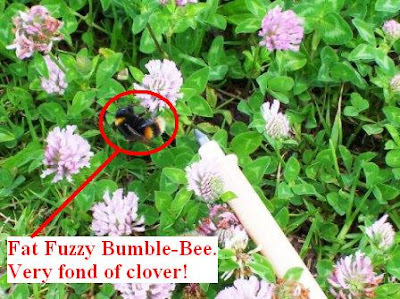 Now this all sounds negative, but lets be perfectly clear here, I have no doubt that it was an absolutely stunning improvement on what field naturalists would have had before these pencils became available! Imagine carrying quill and bottled ink around outdoors and trying to quickly write a few notes! Or wax tablets and scriber. Compared to these, a piece of graphite in a wooden holder would have been a fantastic improvement. Talk about convenience! The “best thing sliced-bread”, but then they didn’t have sliced bread back then. Perhaps people said “The best thing since the pencil” when sliced-bread first came onto the market? I’d like to finish this on a positive note – I thoroughly enjoyed using Der Gessner outdoors for a day, it was a great little emotional link to the past, giving me a real sense of history. Get yourself one soon. A while ago I put up a posting on sketch pencils, so it seems time to say something about their brothers, clutch pencils. Actually the term ‘leadholder’ is probably a more precise name for what I mean when I say clutch pencil. I am talking about those pencils that take a long stick of (usually) 2mm lead and it’s held in a little set of jaws at the tip. My earliest definite memory of a pencil is actually of a clutch pencil. I think I was about 7, and I remember finding a dusty old clutch pencil tucked away in a forgotten corner of my father’s home-workshop. I recall it had a plastic body and a diamond cut chrome metal grip section that was starting to corrode. It was very aggressive on the skin! It was from some far-away foreign land like Germany. I don’t think I had ever seen any sort of non-wooden pencil before. You are probably thinking it’s rather strange I remember all this. A bit mad even by my standards! Just another confirmation of what a nutcase I must be. Well I think there is a reason I remember this, it’s because this particular memory continues on just a little bit longer to when I found something else, a Stanley knife, and then there was lots of blood! Man I was scared. Luckily though, I missed the really important bits of me, and the doctor stitched me up as good as new. I have some sort of a like-dislike thing going on with clutch pencils. Perhaps it’s because of my early association of them with a scary incident? I want to like them more, but I just don’t. On the other hand, I’ve always been rather intrigued by the leads and their packaging. These days clutch pencils are obviously completely out-sold by ‘ordinary’ thin-lead mechanical pencils. I’m no expert, but as far as I can figure it out, "thin-leads" started to become available in the late 1950’s, early 1960’s. I think they had improved in strength and become commonplace by the mid-1970’s. From a few old sales catalogues and adverts that I’ve looked at, in the late 1950’s and early 60’s you often see 0.9mm (0.036”) lead called Real Thin lead and 1.18mm (0.046”) called Standard lead. By the early 1970’s there are Ultra-Thin or Super-Thin 0.5mm (0.020”) leads, and by the 1980’s 0.5mm thin-lead mechanical pencils dominate the scene, so much so that they are often no longer referred to as Super-Thin leads, they’re just normal. Staedtlers website implies they released their Mars Micro thin leads in the 1970’s. In the early 1980’s, I recall a tutor in my drawing class talking to us about what pencils to use. He suggested a couple of 0.5mm mechanicals, but also mentioned we could of course use traditional clutch pencils and sharpen the lead with sandpaper, or a little lead-pointer, but why bother? Then a little later when I was out in the workforce I remember that most of the older guys had a clutch pencil in the pencil holder on their desks, but they used thin-lead mechanical pencils. Their clutch pencil was sort of like “Old Favourite” they just couldn’t throw away, but didn’t actually use anymore. I don’t really have a lot of clutch pencils, but somehow I am slowly ending up with a collection of leads. You can buy these leads for a few dollars on eBay, but then I live in a land far far away, so shipping often costs many times the price of the item. Not quite such a bargain. Anyway, here are a few pictures. Perhaps more to come in the future. Photo - VERITABLE PROOF THAT LIFE ISN'T FAIR! 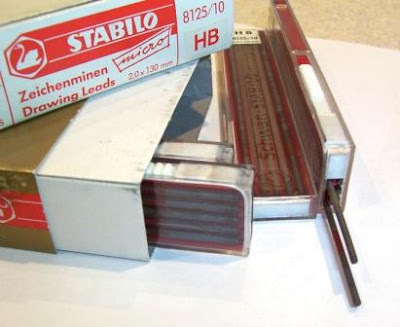 - Two tubes of Staedtler leads, note how the printing runs from the end to the white/black cap on the top one, but is reversed on the other one, running from the cap to the end. If I was a stamp or coin collector this sort of reverse printing would surely make me a rich man! Footnote: Now if you really want to know about these types of clutch pencils or leadholders, then Leadholder.com is the place for you. Its chock full of all sorts of interesting stuff, but be warned, there might be a few snippets of slightly PGR rated stuff, like a bad word or a picture of “Hot Hot Heidi” the Staedtler girl.